A solenoid is a tightly wound helical coil of wire whose diameter is small compared to its length. The magnetic field generated in the centre, or core, of a current carrying solenoid is essentially uniform, and is directed along the axis of the solenoid. Outside the solenoid, the magnetic field is far weaker. 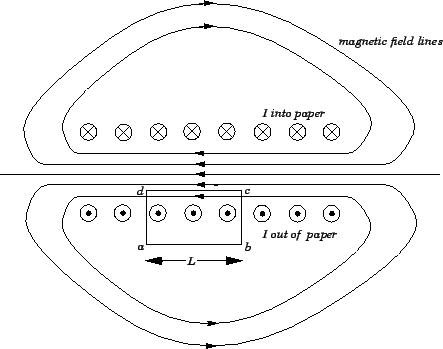 Figure 27 shows (rather schematically) the magnetic field generated by a typical solenoid. The solenoid is wound from a single helical wire which carries a current . The winding is sufficiently tight that each turn of the solenoid is well approximated as a circular wire loop, lying in the plane perpendicular to the axis of the solenoid, which carries a current . Suppose that there are such turns per unit axial length of the solenoid. What is the magnitude of the magnetic field in the core of the solenoid? Thus, the magnetic field in the core of a solenoid is directly proportional to the product of the current flowing around the solenoid and the number of turns per unit length of the solenoid. This, result is exact in the limit in which the length of the solenoid is very much greater than its diameter.